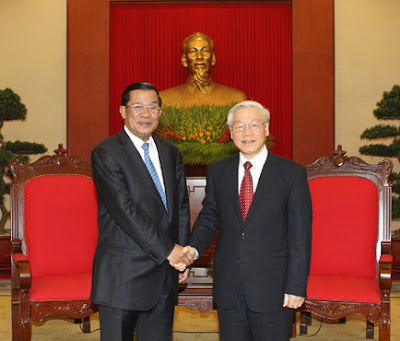 Two days after opposition calls for renewed negotiations, Information Minister Khieu Kanharith announced yesterday evening that the ruling party will sit down with its opposition counterparts on Thursday to talk election reform, though opposition leaders last night weren’t so sure. 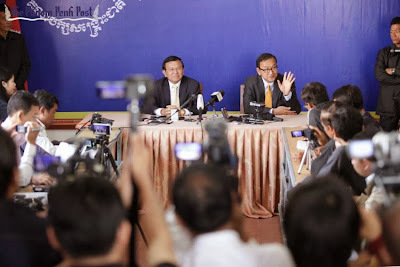 Speaking at a gathering of journalists at the Cambodiana Hotel yesterday, Kanharith said that Prime Minister Hun Sen would sit down across the table from opposition leader and Cambodia National Rescue Party president Sam Rainsy for the first time since September, but only to negotiate on the subject of electoral reform. Where a Third Hand Group From? 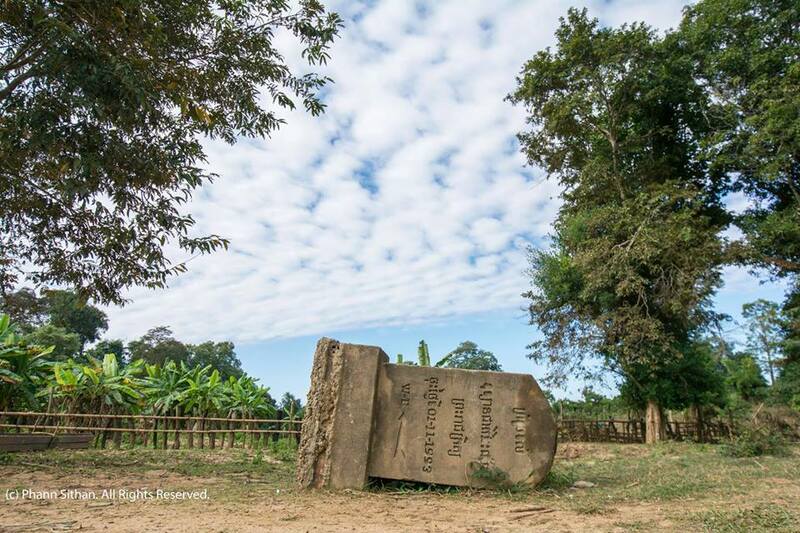 រដ្ឋាភិបាល និង​គណបក្សប្រឆាំង តែងតែ​រុញ​ដាក់គ្នា​ទៅវិញទៅមក ទាក់ទង​នឹង​វត្តមាន​របស់​ក្រុម​ជន​ទី​បី បាតដៃ​ទី​បី ឬ​ក្រុម​ឱកាសនិយម​នៅក្នុង​ក្បួន​បាតុកម្ម ឬ​ការតវ៉ា​ណាមួយ។ តើ​ក្រុម​ទាំងនោះ ជា​អ្នកណា? មកពីណា? 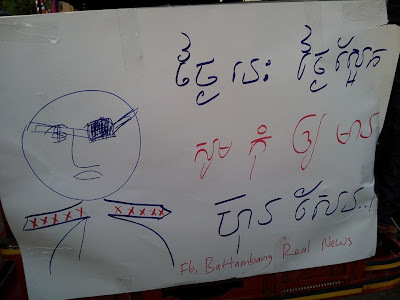 ធ្វើការ​ឲ្យ​អ្នកណា? 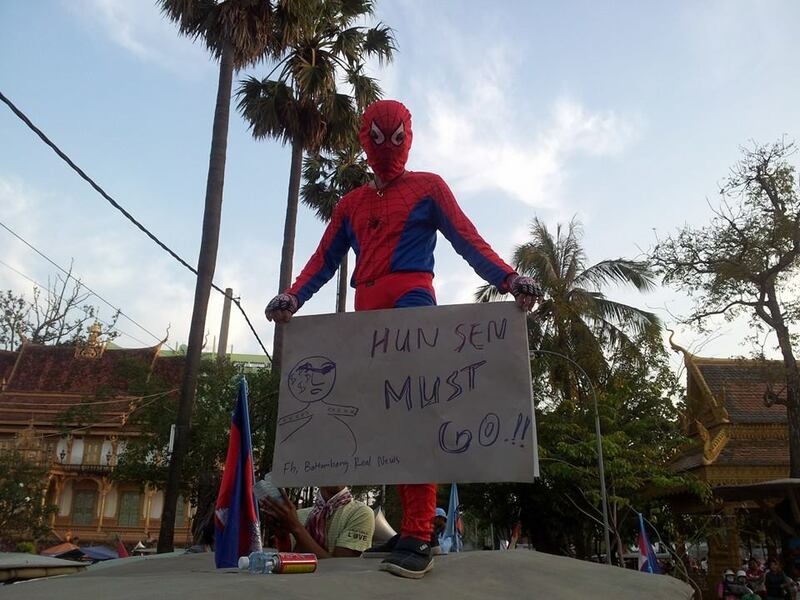 The largest protest ever took place on Sunday December 29, 2013 demanding Hun Sen to step down brought a political tsunami and grievances to the regime that has oppressed people over three decades. Albeit multiple protests took place at the same time, there were few polices presented at the scenes. 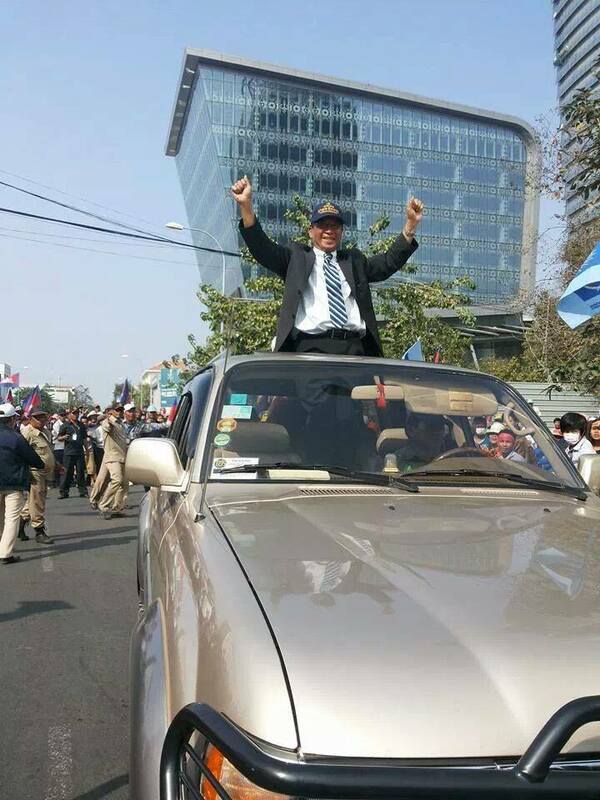 Hun Sen, an apathetic leader, seems ignore the demand, and he may try to outlast protesters, allowing them to exhaust and to fade out by themselves. On the other hand, Hun Sen may use a Hanoi taught tactic, tricking his enemies into a trap and ambushing. Now our visible conjecture based on a pattern in the past, smaller protests were met with violent crackdown by polices, but mass protests gained more respect from them. 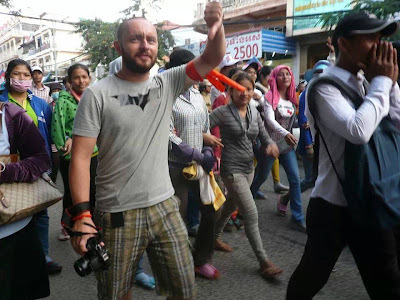 Furthermore, Previously, mass or small protest must get a permission from the City Hall or Interior Ministry and arranged several meetings between protest organizers and city officials, but now those restrictions seem no longer fallow or impose by anyone. All protesters from different groups got free hands to march through the city streets as long as they are organized and peaceful. It is the first time that protesters were allowed to march or to stay in front of government power structure facilities--prime minister office building, defense ministry, economic and finance ministry, and several other facilities. Opposition leader Sam Rainsy called for renewed talks between the opposition and the ruling party on Saturday, going on to say that the discussions should include not only the two parties but civil society representatives as well. Speaking to reporters at Cambodia National Rescue Party headquarters, Rainsy suggested negotiations be set for the first three days of January, and said a wide range of issues would be up for discussion – not just the current political stalemate. “We want to have a big meeting to talk, to solve the nation’s problems. Now we have seen that at the end of this year, the nation’s problems are increasingly serious. It is not only political deadlock, but it is also about the problem of salary demands by workers. Tuk-tuk, motorbike and taxi drivers were among hundreds of workers from Cambodia’s “informal economy” who called on the government yesterday to cap fuel prices at 4,000 riel ($1) per litre, amid claims that the current 5,000 riel price leaves them unable to cover any more than daily living costs. The group rallied outside the Ministry of Economy and Finance, a short walk from Freedom Park, where opposition party supporters protesting against July’s election and garment workers demanding higher wages converged yesterday. HANOI, Dec. 23 (Xinhua) -- Vietnam has attached importance to the comprehensive partnership with Russia and regarded Russia as the most important partner in Vietnam's foreign policy. The remarks were made by Uong Chu Luu, Vice Chairman of Vietnam ' s National Assembly here on Monday while meeting with Ivan Melnikov, Vice President of the State Duma of the Russian Federation during his working visit to Vietnam. Melnikov said that besides close cooperation between the two countries, two legislatures have enjoyed practical and effective relations, which have made great contribution to strengthening Russia-Vietnam comprehensive partnership. Post by The Khmer Post. 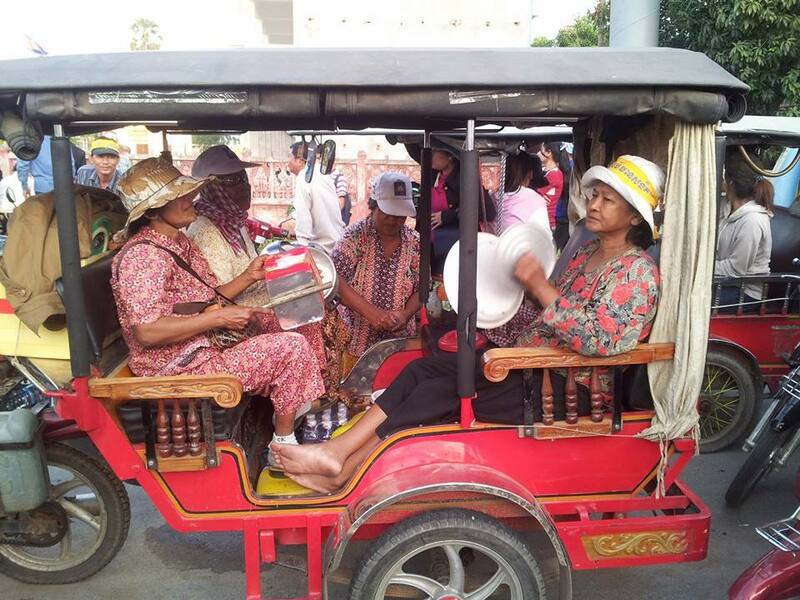 After garment workers swelled turnout at the opposition’s ongoing demonstrations yesterday to what some estimated to be double the number seen at any previous rally, party leadership announced a weeklong moratorium on the marches. Demonstrators will continue to assemble at Freedom Park each day, said Cambodia National Rescue Party MP-elect Mu Sochua, hours after protesters took to the streets yesterday. But instead of marching, protesters will hold “peoples’ conferences” – during which they will be allowed to speak freely onstage – each day from 4:30pm to 6:30pm. 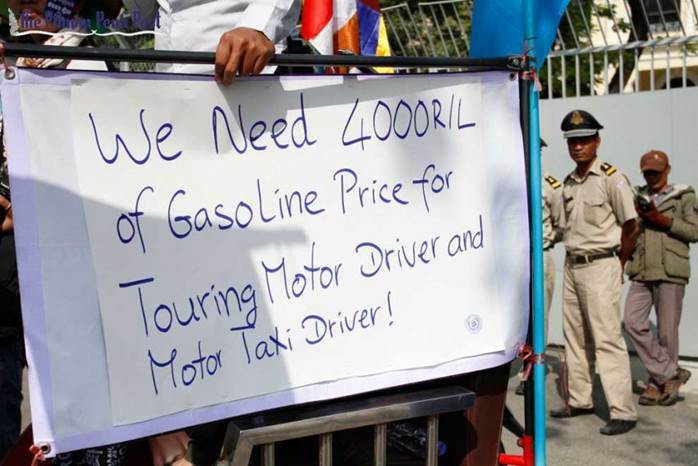 The number of protesters marching yesterday appeared to exceed last Sunday’s estimated 100,000 people, with demonstrators continuing to demand the government increase the minimum monthly garment wage to $160 next year, rather than $95, which the Labour Ministry set last week. In response to the growing strike, the Garment Manufacturers Association in Cambodia (GMAC) yesterday said that it had no choice but to close factories until the issue was resolved. In an open letter from GMAC, the factory association warns its 473 members that protesters could pose a danger to workers and factory property. The letter levies allegations that striking union members destroy factory property and force employees who do not want to walk off the job to join. Unions the letter says are guilty of these transgressions include the Coalition of Cambodia Apparel Workers’ Democratic Union (C.CAWDU), the National Independent Federation Textile Union of Cambodia (NIFTUC), the Collective Union of Movement of Workers (CUMW), the Free Trade Union, the Cambodian Confederation of Unions (CCU) and the Cambodian Alliance of Trade Unions (CATU). GMAC also yesterday declined an invitation to meet with the Ministry of Labour and heads of six unions, including some mentioned in the letter, for negotiations this morning. Members of GMAC will only sit back down at the negotiating table when the safety of employees who want to attend work can be guaranteed, the letter says. Read a detailed and excellent article The Wall Street Journal here. 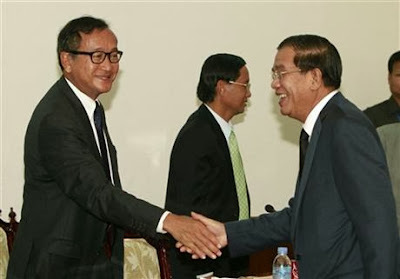 PHNOM PENH (The Cambodia Herald) -- The ruling Cambodian People’s Party (CPP) and the opposition Cambodia National Rescue Party (CNRP) have yet to contact each other concerning the talks proposed by CNRP leader Sam Rainsy. "To date, the officials of the two parties haven’t yet contacted each other to set the date for negotiations," Interior Minister Sar Kheng (pictured) told reporters after a National Assembly session on Monday. 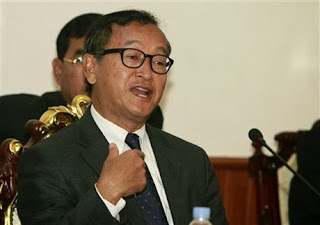 Sam Rainsy had called for talks this past Saturday with the ruling party to break Cambodia's ongoing political deadlock. A CPP official had welcomed the CNRP's call for negotiations, saying that the CPP is always willing to negotiate with the CNRP. 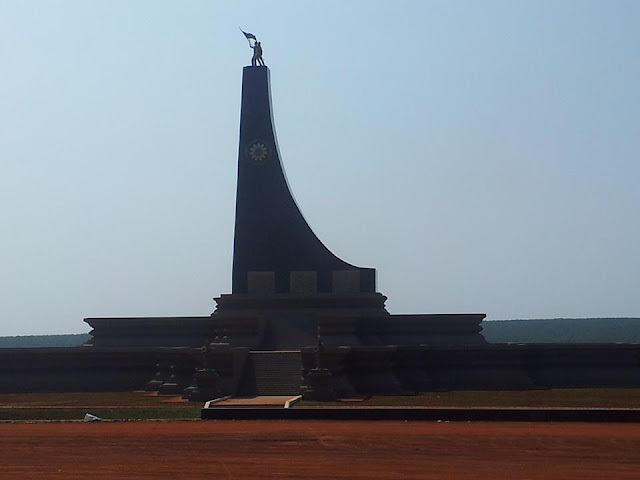 However, the opposition party said that despite their call, they still demand the government hold a re-election. PHNOM PENH (The Cambodia Herald) -- The government today warned to take tough actions against those who provoke troubles for the operation of the garment manufacturers and the daily work of the workers. “The factory employers shall resume operation and the workers shall go to work as usual on 2 January,” said the Ministry of Labor and Vocational Training in its statement today aft the collapse of minimum wage talks this morning. 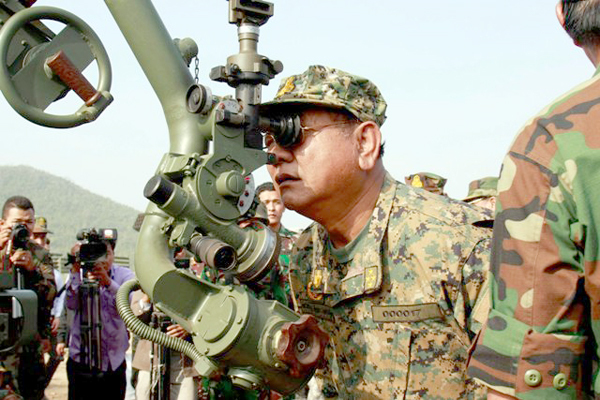 The ministry added that “Competent authorities will take tough actions in accordance with the laws against provokers who troubles the factories and workers”. The ministry also said that the minimum wage (USD 95) shall be based on the decision of the 24 December. The ministry appealed to the labor unions to cooperate well with the garment manufacturers in order for the smooth operation the manufacturers and the work of the workers. Hundreds of manufacturers closed its door due to nationwide strikes and protests in order to demand minimum wage of USD 160 per month instead of USD 95. រូបភាពមានអត្ថន័យរាប់ម៉ឺនពាក្យអំពីឧទ្យានជាតិវីរៈជ័យ និង ការគោរពព្រះមហាក្សត្ររបស់ រដ្ឋាភិបាលសព្វថ្ងៃ សូម្បីតែឧទ្យានជាតិ ដែលជាតំបន់ការពារដោ ព្រះរាជក្រិត្យក៏ត្រូវបាន លុកលុយ ទន្រា្ទន និង បំផ្លិចបំផ្លាញ។ នេះហើយជាការគ្រប់គ្រងដ៏ភ្លឺស្វាងប្រកបដោយគំនិតទណ្ឌិតស៊ីជោ! មែន The destruction of Virachey National Parks in northeastern provinces of Cambodia is protected by a royal decree. 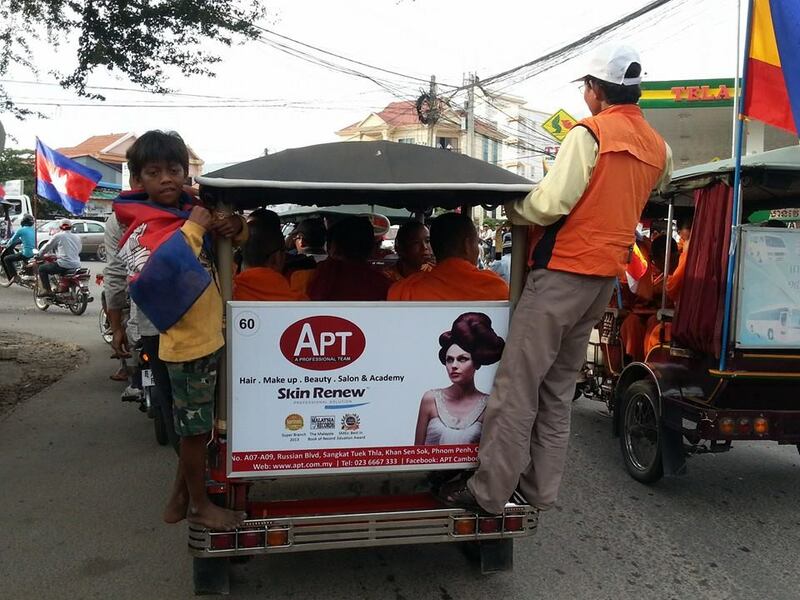 ថ្ងៃទី30 ធ្នូ Mam Sonando is ready to take part in the biggest demo today, DEC 30. 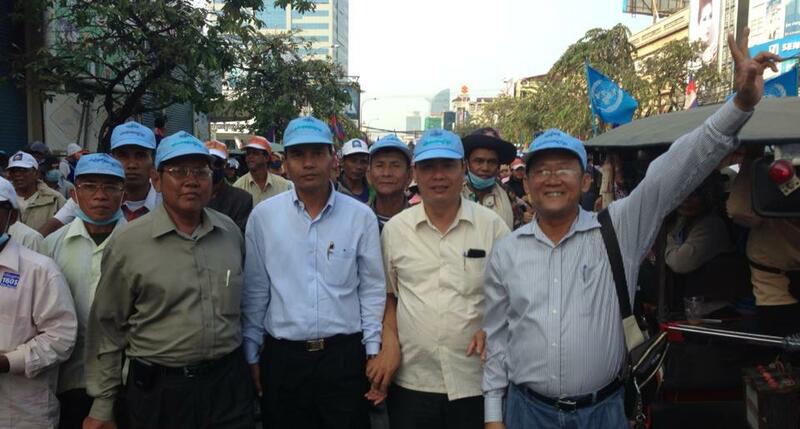 Kem Sokha: "I admire the protesters who are disciplined, love peace and struggle with bravery and firm stance" 29/12/13 លោក កឹម សុខា "ខ្ញុំសុំសរសើរ បាតុកររបស់យើង គឺមានវិន័យ ស្រឡាញ់សន្តិភាព គឺតស៊ូដោយក្លាហាន និងម៉ឺងម៉ាត់"
Post by Borng Pdey Oun. 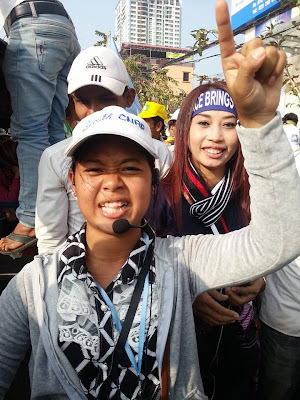 December 29, 2013 PHNOM PENH — In Cambodia Sunday, tens of thousands of people marched through the streets of the capital calling on Prime Minister Hun Sen to quit. 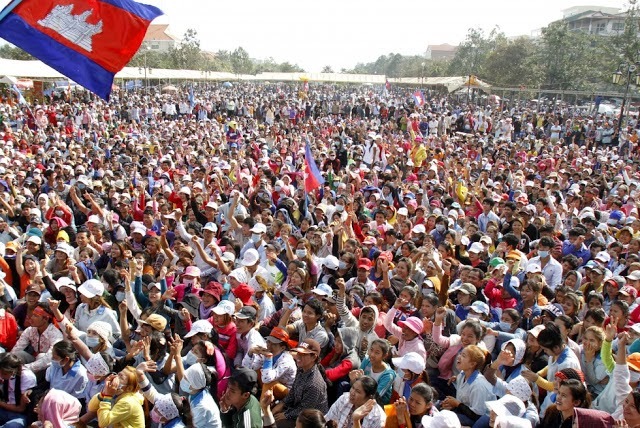 The public outpouring of sentiment in recent months against the long-time leader is unprecedented, and has brought together opposition party supporters and many of Cambodia’s 400,000-strong garment workers. 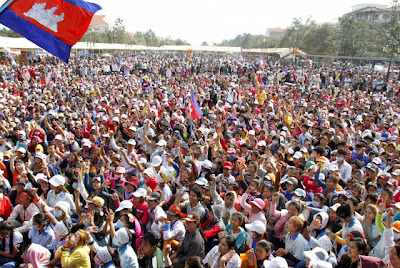 Before leading the huge march through the streets of Phnom Penh, opposition leader Sam Rainsy told the crowd at Freedom Park in the city center that this is a historic day and that the will of the Cambodian people will prevail. Rainsy said all Cambodians believe Hun Sen’s government is illegal, adding that the prime minister would hear their voice. He said everyone wants to see a change in leadership, and he called for fresh elections. 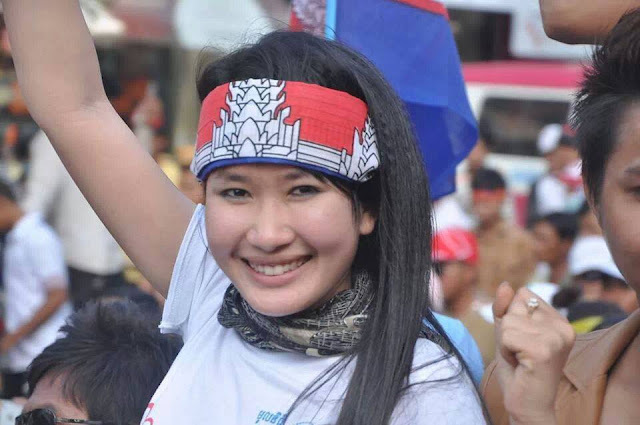 ​The opposition Cambodia National Rescue Party (CNRP), which Sam Rainsy leads, stunned the ruling party in July when it came close to winning the general election. The opposition has since claimed the election was stolen. It initially sought an independent investigation into the ballot. 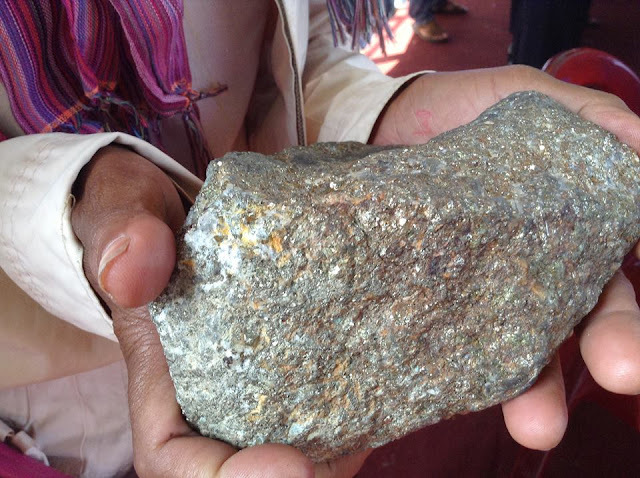 But Prime Minister Hun Sen - who has been in power for nearly three decades - rejected that, and talks between the two sides quickly stagnated. The 55 opposition MPs-elect have refused to take up their seats in the 123-seat National Assembly. They want Hun Sen to quit and a second election held next year. 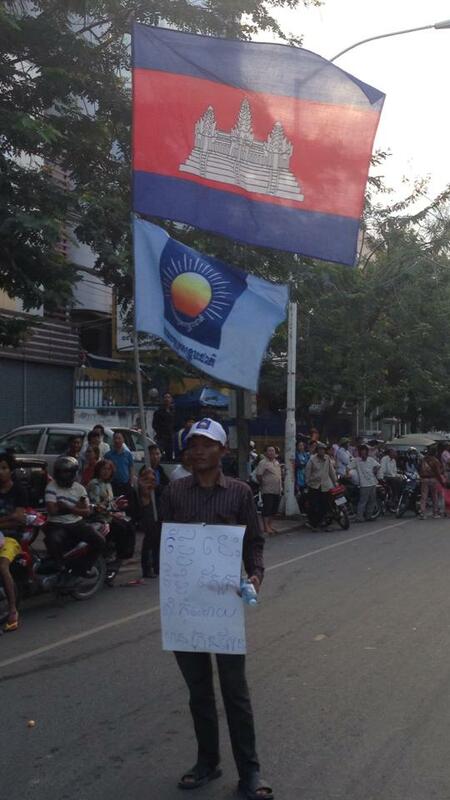 Hun Sen has rejected both of those demands, too. 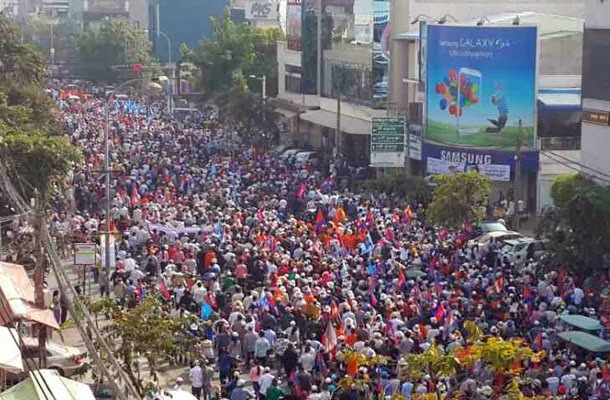 So for the past two weeks, the opposition has staged daily rallies and marches in Phnom Penh, drawing between a few thousand supporters and - on Sunday a week ago - as many as an estimated 40,000. The march this Sunday saw even more people turn out. Counting crowds is a notoriously tricky task, but this march was clearly much larger than last week’s. 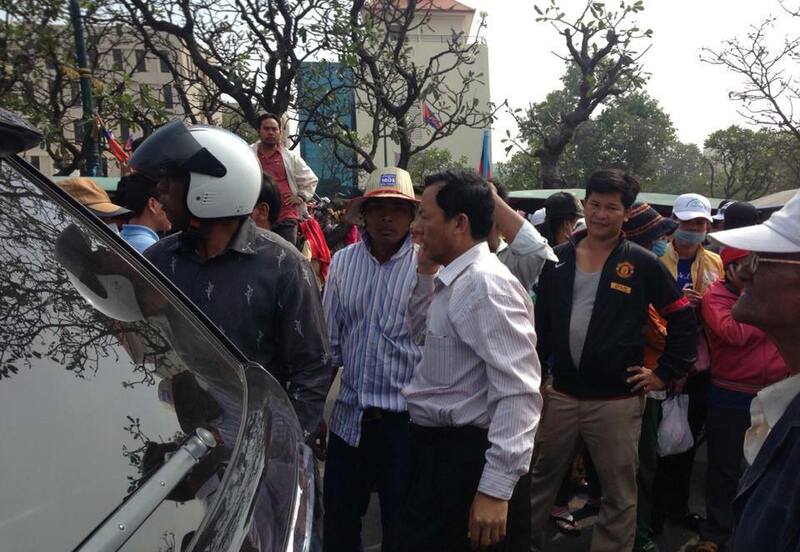 Once again, the refrain was that Hun Sen must go. Expressing such sentiments publicly in Cambodia even a year ago would have been unthinkable, and is indicative of how far the country’s political landscape has shifted. 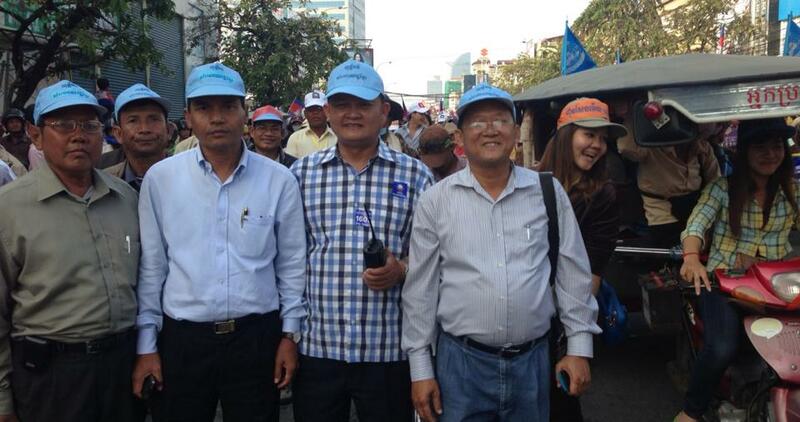 The opposition claimed the number of anti-Hun Sen protesters has swelled to over a million on Sunday 29/12/13. Cambodia opposition leader Sam Rainsy appealed Saturday to Prime Minister Hun Sen, who heads the ruling party, to agree to talks in order to find a way out of the country's current political crisis. At a press conference, Sam Rainsy, leader of the Cambodia National Rescue Party, said his party wants to have an "open talk" with the Cambodian People's Party next week. He said that, starting from Wednesday, the first day of the New Year, the CNRP requests an open meeting among political parties and major civil organizations with the participation of the public in order for them to listen to the talks. 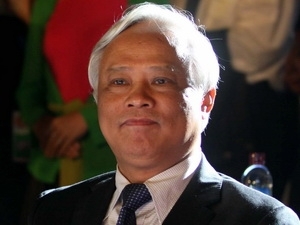 In an immediate response to Sam Rainsy's appeal, Sar Kheng, deputy prime minister and minister of interior, said the CPP's door is always open for negotiations with the CNRP but he did not give any specific date for such a meeting as Hun Sen just returned home Saturday from a three-day official visit to Vietnam. 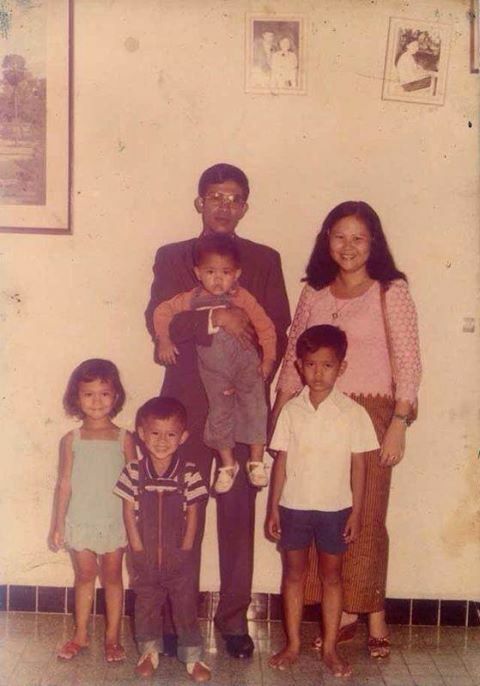 Also Saturday, Sam Rainsy made a surprise and rare statement by extending his warm wishes to Hun Sen and his family for happiness and success in work for the betterment of Cambodia and people in the New Year. 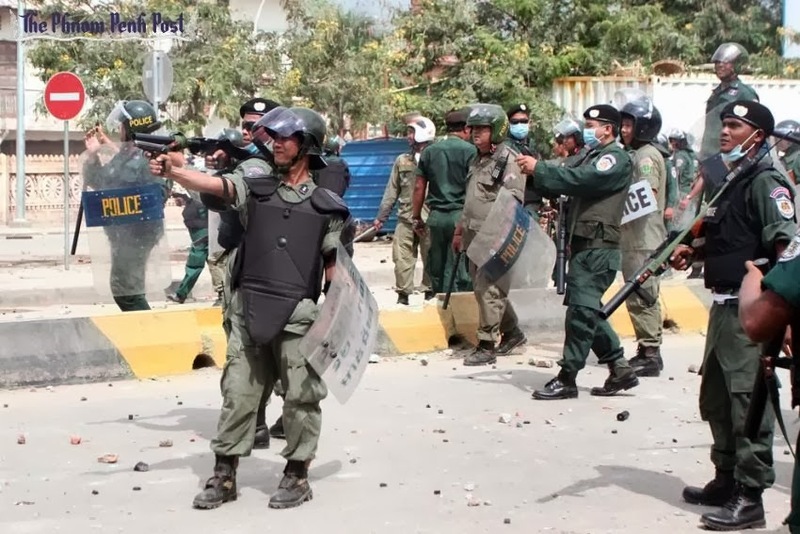 However, both Sam Rainsy and his deputy Kem Sokha said that opposition protests will go on unless a proper solution to the current political crisis is found. 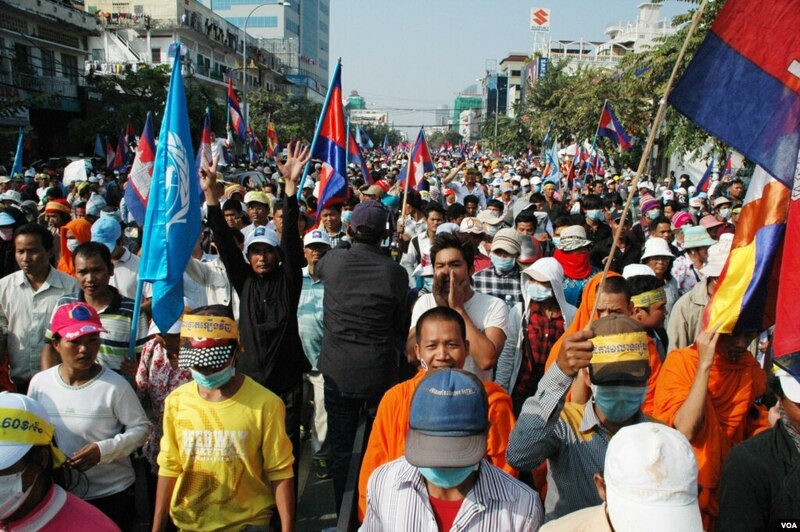 Protesters in the Cambodian capital included Buddhist monks, garment workers, farmers and supporters of the main opposition party. 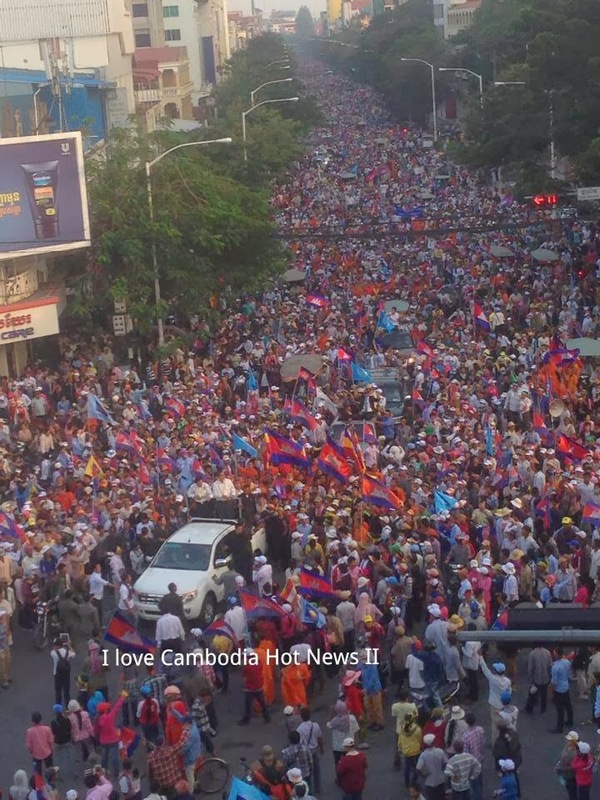 PHNOM PENH, Cambodia — Tens of thousands of antigovernment demonstrators marched through Phnom Penh on Sunday in one of the biggest acts of defiance against the nearly three decades of rule by Cambodia’s authoritarian prime minister, Hun Sen. 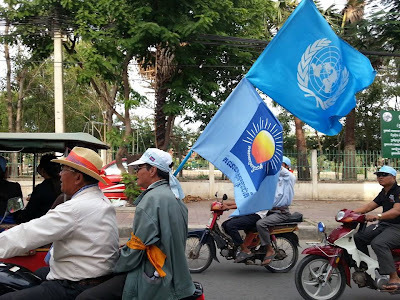 The procession, which was peaceful and stretched for several miles through a commercial district of Phnom Penh, the capital, brought together protesters with a diverse list of grievances: Buddhist monks, garment workers, farmers and supporters of the main opposition party. They were united in their calls for Mr. Hun Sen to step down, their chants — “Hun Sen! Get Out!” — echoing down the broad avenue where they marched. In July, Mr. Hun Sen’s party claimed victory in disputed elections that the opposition and many independent monitoring organizations said were deeply flawed. 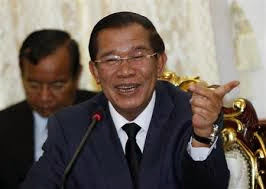 Mr. Hun Sen formed a government despite the growing protests by the opposition, which has boycotted Parliament and is calling for new elections. Cambodia’s political stalemate and protest movement have been somewhat overshadowed by the turmoil in nearby Thailand, where antigovernment demonstrators are rallying to block elections and install a “people’s council” to govern the country during what they describe as a hiatus from democracy. 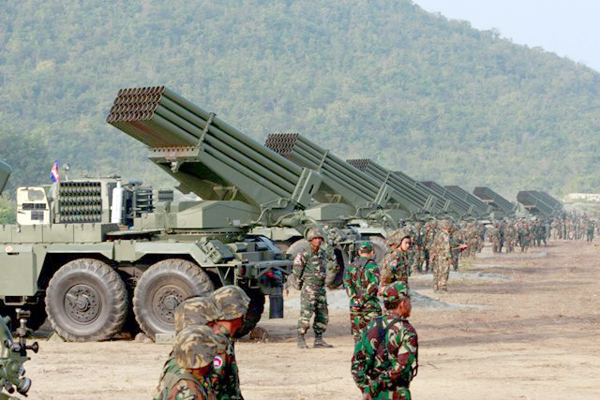 But some analysts in Cambodia describe the past few months here as a watershed for Cambodian society, which for years has been dominated by the highly personalized rule of Mr. Hun Sen, whose party has tight control over major institutions in the country, including the army, the police, the judiciary and much of the news media. Protesters blocking traffic and marching through downtown Phnom Penh remain a jarring sight after years during which the main message from the government has been that people should be grateful for the unity and development that Mr. Hun Sen brought to Cambodia after many years of war.